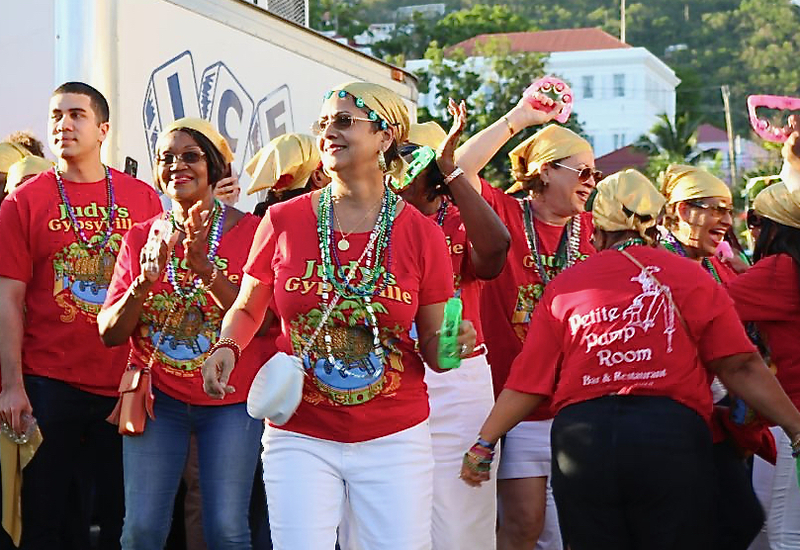 Judy Watson remembers when she was growing up, getting excited each year for Carnival – the parades and the costumes of her parents’ Carnival troupe, the Gypsies. That wonder and excitement hasn’t dimmed, and Friday, Watson was honored with the naming of the Carnival Village. “As a little girl, I used to run around and play with the costumes, and I loved watching my parents wear them in the parade,” Watson said at the opening of the “Judy’s Gypsyville” Village on St. Thomas Friday night. Watson’s parents, Aracely and Gerard Nicholson, helped organize the island’s first Carnival in 1952. Every year since, the family’s friends and loved ones have marched with the Gypsy Troupe, which Watson has chaired for the past six years. “I helped with the costumes, I grew up and was costume co-chair, and chair,” she said, adding that she has always had a role to play in the festivities, which she continues to look forward to each year. 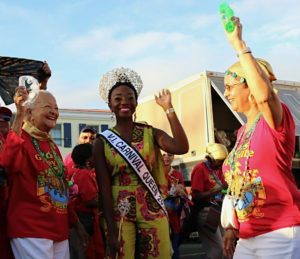 From left, 1952 Carnival Queen Carmen Sibilly joins 2018 Carnival Queen Jikelle Michael and Judy Watson for Friday’s opening of the Carnival village, named in Watson’s honor. Watson led her Gypsies, who were all wearing matching red shirts and waving tambourines, from Emancipation Garden to the Village – named “Judy’s Gypsyville” – where they joined Gov. Kenneth Mapp, Lt. Gov. Osbert Potter, Delegate Stacy Plaskett, Senate President Myron Jackson and this year’s Carnival royalty Friday for the official opening. “When the V.I. Carnival Committee can bring to the forefront an organization like this, and recognize people like Judy Watson, we are doing our job,” V.I. Carnival Committee spokesman Athneil “Bobby” Thomas said as the group cut the opening ribbons. On stage afterward for the traditional presentation, Gov. Kenneth Mapp, presented Watson with a gold pendant crafted on St. Croix and a painting titled “Steel Pan” by St. John artist Livy Hitchcock. Speakers throughout the evening congratulated Watson and the troupe for their contributions to Carnival, and also spoke about the resilience of the territory in rebounding after two hurricanes.